Not only were we working on our cabin, but we still had a business to run. 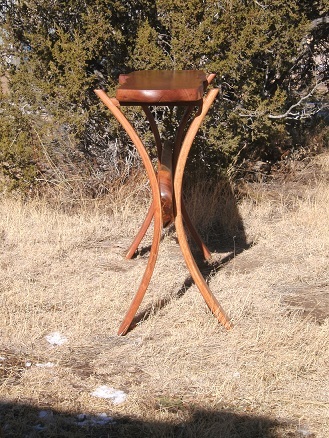 Shows to exhibit at, furniture and vessels to make for those shows and customer orders to fill. Below are some new pieces that we completed for the mesquite show in October. This was a successful show for us, not only in sales, but a feature on CNNireport interviewing me at the show, www.ireport.cnn.com/docs/DOC-505989 and an opportunity to send a few pieces to England. 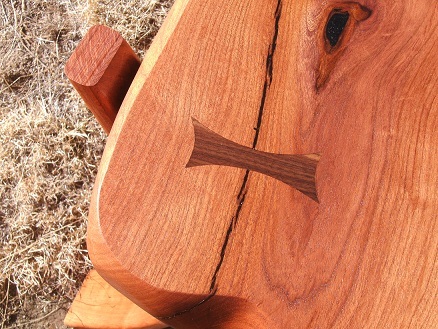 We will be sending our mesquite Shangrila Rocker, some of the mesquite vessels pictured below and a mesquite ribbon sculpture, also pictured below. We are very excited to go abroad and to see how our creativity is accepted over there. Thanks to Amie and Joe Prest at Hill Country Mesquite www.hillcountrymesquite.com for presenting this opportunity to us and vesting their time and money to make this all happen. The mesquite festivals are our favorite shows. We get a chance to meet up and visit with old friends and customers and meet new people. These shows have some wonderful people that exhibit and put it on with a lot of creative ideas. We all share the same love, hate relationship with mesquite. To see more of these wonderful artists, please visit www.texasmesquiteassn.org . 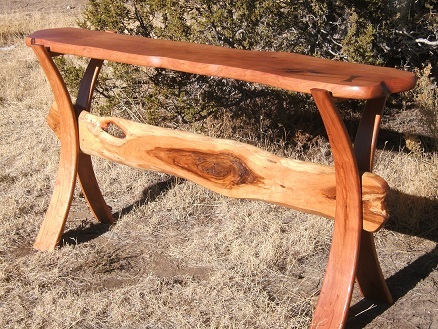 The hall table pictured below was made from a gorgeous slab of mesquite. 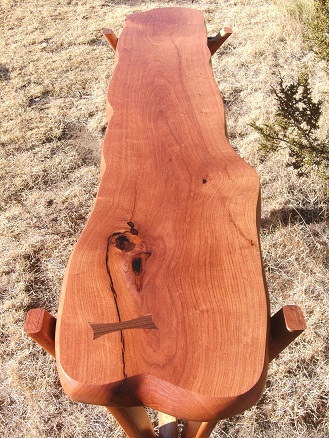 The top and middle are a natural slab and the legs are bentwood lamination. 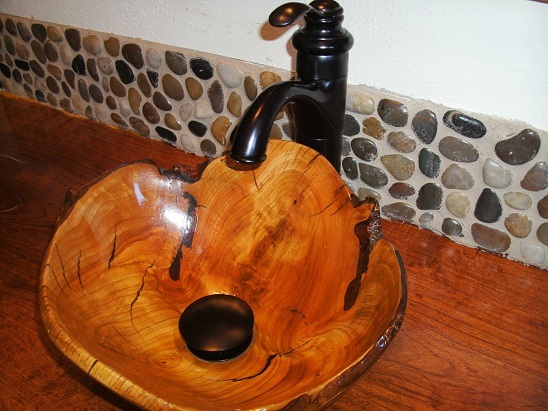 These two unique features blend well together and give the piece a contemporary rustic look. 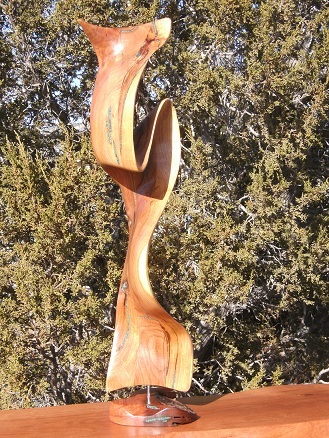 Scott inlayed a walnut bowtie on the top to secure a large crack andthis uniqe and difficult feature adds even more to this piece. It is approximately 5ft long and 14″ wide. These vessels were all carved first with the chainsaw and then grinders were used to do all the finess work. The canyon shape has been quite popular for us and comes in all sizes. The one below is the smallest, at approximately 12″ T x 12″L x 5″W. 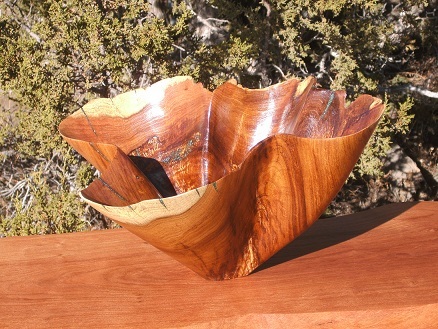 The large wavy bowl has a lot of folds and waves in it that are quite difficult to create. 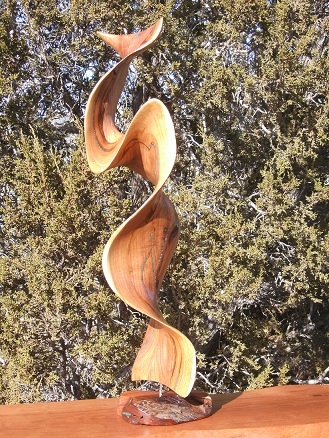 Scott has to be careful to not go through the wood with both the chainsaw and grinders while creating these. It is approximately 18″ Diameter and 12″ Tall. The smaller vessel is shaped like a vase, with simpler waves created. It is approximately 8″T and 5″ Diameter. Lapis was inlayed into this piece for a different look. The last one is a juniper vessel called “Lily of the Valley”. Scott did some unique carving that curves up the piece on both the outside and inside. 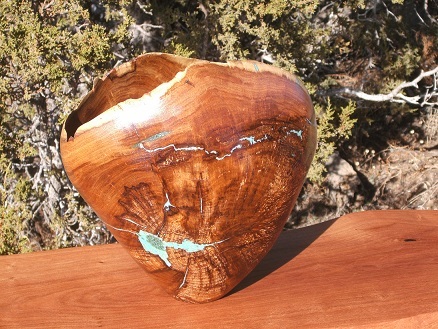 It was carved from an approximate 600 year old Juniper tree.Scott left a section of a branch on the top along with some of the bark. I went all out with the turqoise and inlayed it in some of the folds, along with the cracks and voids. This made the sanding quite difficult, but it looks good. 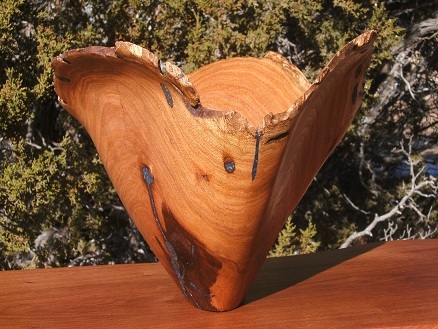 It perches on a cherry burl base and is approximately 26″T x 18″ Diameter narrowing down to the base. For the past several months, working on the cabin has consumed our lives. But it has been well worth it. We’ve had some great friends and family that have helped us out during some of the process and we can’t express our appreciation enough. Life in the cabin has already proven to be much easier and enjoyable so far. We still have some work to do on it, but for now we’re so very thankful to be in here, and just before winter hit. I believe the happiest of us is Sampson. He has room to move, isn’t in the way and it’s nice and cozy in here. Since he is the most important part of our lives, it makes us happy to see him so content. God truly blessed us with a wonderful dog. 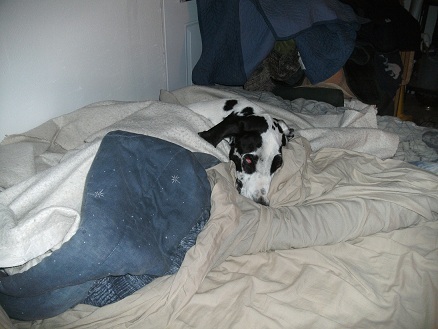 Sampson all bundled up staying warm. He’s not spoiled at all! We are so proud of all the work we’ve put into it, especially the bathroom. We wanted to make sure that even though our cabin was small, that we had special features. And that anyone who visited, knew that woodworkers lived here. The bathroom has some of our favorite features so far. Of course we’re not done yet. So who knows what the rest of the cabin will look like when we finish. We opted to go with all wood countertops. And mesquite was the wood of choice. 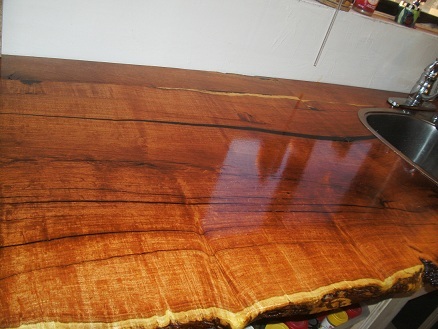 Not only because we had some slabs on hand, but because it is such a gorgeous wood. It was a big job filling in all the cracks and voids with epoxy, but well worth it. We inlaid turquoise into the bathroom counter. 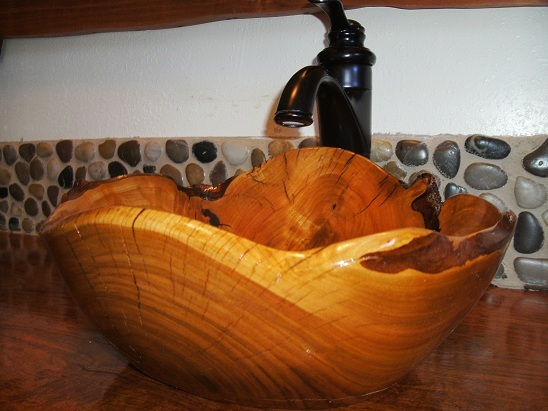 Scott carved a sink out of a cherry log, leaving the natural edge. It turned out beautiful and really adds to the bathroom. Several coats of a marine finish were applied so it would stand up to all the water usage. 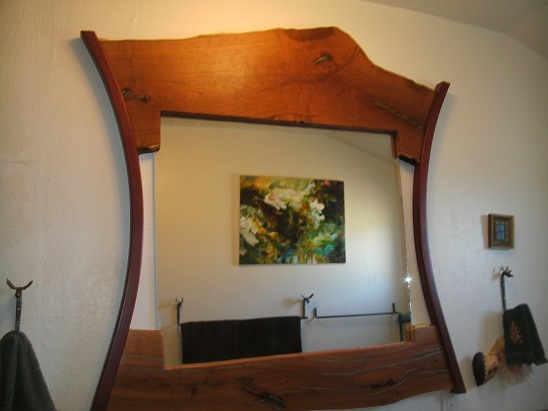 We decided to keep a mesquite and african purple heart mirror that we had made a while ago. And it ties in nicely with everything in the bathroom. We both fell in love with the river rock look for a shower and therefore decided to do it for ours. It was easy going up, but the job of having to wipe each and every rock proved to be a challenge. Not only was it very time-consuming, but your fingers get very sore after a while. But after seeing everything come together, it was well worth it. We still have to make the cabinet doors throughout, but we’ll get to it soon. We collected other artists work over the past few years to incorporate into our cabin and we finally get to show them off. 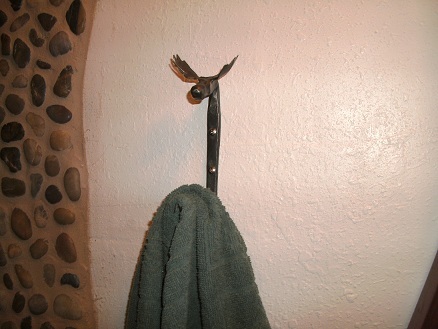 We had an iron artist create our towel rods and hooks. They have little moose and elk heads on them and are so cute. 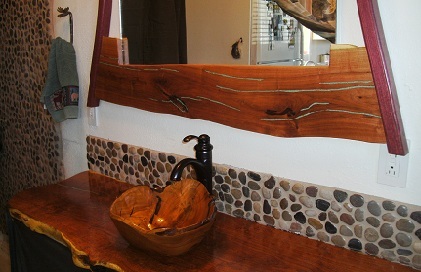 Those along with some wall art and cabin rugs, round out the cabin look of the bathroom. We also incorporated other artists work in the other parts of the cabin. We have some tile to put up for our kitchen backsplash soon, drawer pulls and other artwork placed all over. Below is a picture of our kitchen countertop. 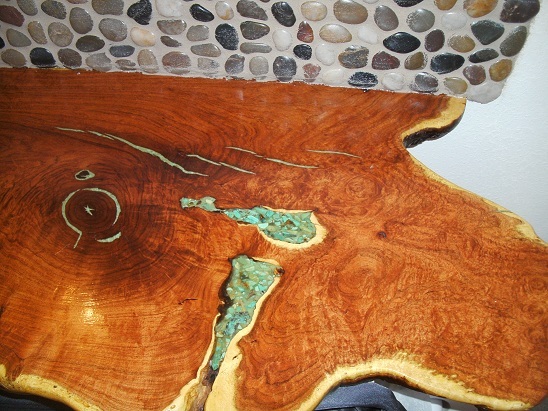 This was a bookmatched slab of mesquite that spans 14ft. It has some incredible figure and I hate covering it up, so the counter has as little amount of stuff placed on it as possible. 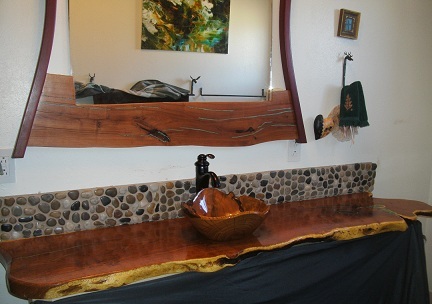 For both the kitchen and bathroom counters we left the natural edge, only removing the bark and lightly sanding the edge to bring out the yellow sap wood. 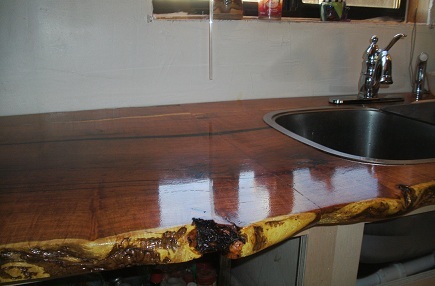 We applied a marine finish to ensure that they could stand all the water and abuse. We are so happy to finally be in our little cabin and can’t wait to start the next project and add more special features. You are currently browsing the Shangrilawoodworks's Blog blog archives for December, 2010.